Welcome to the Hawks Prairie Rotary Military Family Day. The Hawks Prairie Rotary Foundation is helping local families of those serving our country. Hawk’s Prairie Rotary continues to support families of those serving our country in all branches of service. Please join us as we celebrate with our community’s Military Families. We will have lots of free food, fun, and live entertainment. Festivities start at 09:30 AM. We will have a 30 minute scheduled program at 11:00 AM followed by free food, drinks, and entertainment by the Jonathan Harris Band. 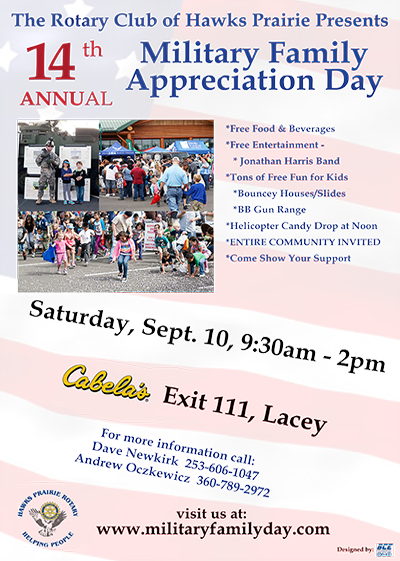 We invite you to join us by attending the Military Family Support Day on Saturday, September 10, 2016 at 09:30 am.